Ben Davis, the new Michelin Clio Cup Series driver for the #R4H Academy, under the #RacingforHeroes charity initiative, had a great start to the 2015 season, Saturday 11th and Sunday 12th April, with experienced team Finesse Motorsport Ltd (FML). It was a nervous start to the first qualifying session of the 2015 Michelin Clio Cup Series as the day began with grey clouds looming overhead. 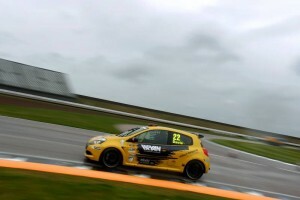 Young Davis, a rookie driver in the Clio Cup Series, had not driven his 3rd generation Clio Cup race car in the rain before and was constantly scouring the sky in search of a break in the clouds. Regardless of much hoping and praying, the rain set in and it was certainly a wet qualifying for all. Davis (Abingdon) needn’t have been concerned, as he set out for the first qualifier and smoothly secured a podium 3rd place start in his first race of the year and a solid 4th for the second race, the second race is based on the drivers’ second fastest lap in qualifying. Later on the track dried out and Davis again showed great form, securing a podium 3rd place start for his third and final race on Sunday. The timings were incredibly close with Davis being only 3 tenths of a second off pole-sitter for Race 1, Randon. Speedway Circuit (Corby) with a four car-wide scrum into the first corner. Davis held his 3rd place position, despite contact from both sides and taking evasive action to avoid Streather’s spin on turn 1. Regardless of this quick-thinking, the contact caused tracking damage to the steering and the young driver had to yield to his FML team-mate Jordan who was hot on his tail. Davis had to work hard to keep the car on the track for the rest of the race. 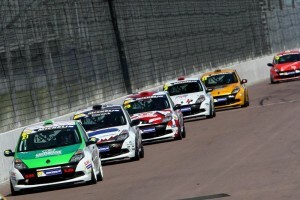 In only his second car race of his driving career, Davis, was keeping pace with fellow team-mate Jordan (a previous Michelin Clio Cup Series winner), and the other two leaders, Herbert and Lidsey, weren’t far ahead. By lap 4, Davis attempted a courageous over-taking move on the inside of team-mate Jordan at Deene hairpin. Unluckily for the rookie driver, this ambitious attempt to reach the corner first resulted in late braking and a brief off onto the grass. This didn’t stop Davis though as he expertly manoeuvred the car back onto the track and only lost two places in the progress. 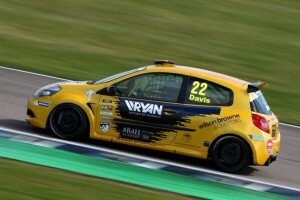 Now the hunt was on, Davis quickly reeled in Randon (an experienced Michelin Clio Cup Series driver with podium finishes) sitting in 5th place and over-took the driver within one lap. By lap 9, Davis had over-taken the slower road car drivers and the back markers whilst consistently holding onto the bumper of 4th place driver, Barley. Then, on the final tour of the race, Davis made his move on Barley at Deene hairpin and raced to 4th place across the finish line. As Race 2 charged off, Davis had a bad start, after struggling with wheelspin. This initial loss of time and a push on Tarzan hairpin from a driver behind meant Davis went wide, costing even more time, and the young racing driver quickly slipped back to 6th place. Despite this bad luck, Davis managed to keep pace with Jordan and Lidsey for the majority of the race. Yet the driver faced more trouble as he concentrated on finding a gap past Jordan, his fellow FML team-mate, Bennett, was applying increasing pressure from 7th and Davis lost 6th place to Bennett. Finishing in the middle of the pack in 7th place, Davis gained 16 points towards the championship and fought some good battles to keep his race position. The afternoon improved greatly as Davis lunged off the grid at the beginning of Race 3 and straight into 2nd place where he held a defensive position from experienced team-mate Jordan. Unfortunately, some light contact pushed Davis wide and he lost his position, and vital time, which gave both Randon and Bennett the chance to over-take at Piff Paff bend. Davis didn’t stay in 5th for long as he quickly reeled team-mate Bennett back in and secured 4th place once again on lap 5. Things started looking up as the young driver began to chase down Randon in 3rd place, but out-of-nowhere, Streather came streaking up the pack and stole 4th place, continuing to win the final race of the day. Davis managed to gain 4th once again by over-taking team-mate Jordan, who suffered from a puncture, and as the last few laps started counting down Randon became under increasing pressure by the rookie driver. By lap 10 there was less than 3 tenths of a second between the two, but all too soon the chequered flag came down and Davis missed out on the podium by less than half a second. This ambitious driver showed experience beyond his hours of racing cars at the first weekend of the 2015 Michelin Clio Cup Series. Davis proved that he can overcome difficult racing situations, working with a damaged car and re-gaining places after costly incidents. Davis won 1st place in the Race Sports Class for all three races at Rockingham and performed at podium level pace throughout, showing the enormous potential of this young driver and that he is certainly one to watch.